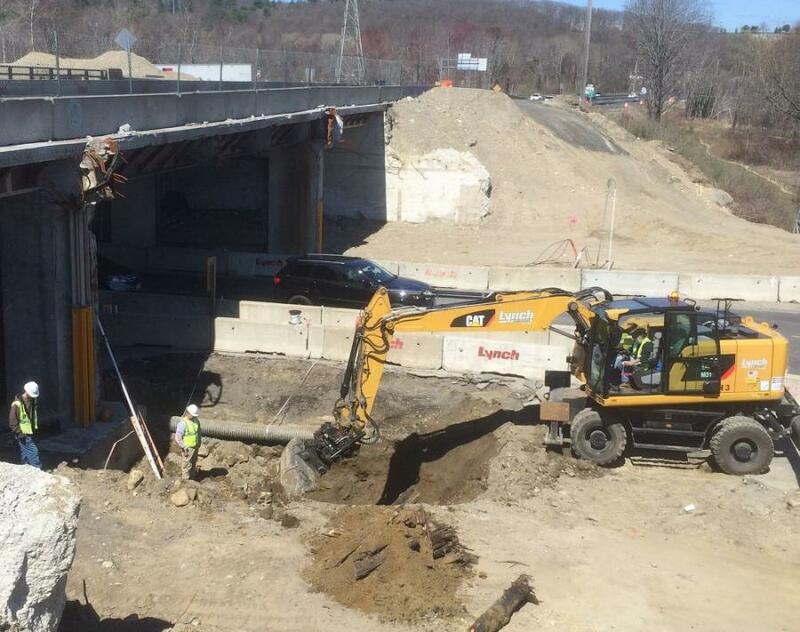 The construction of the replacement bridge that carries Route 146 over the city of Millbury's West Main Street may be the most visible component of MassDOT's Route 146/West Main Street Interchange project, but it's not the only improvement within the project area. In fall 2017, the installation of two roundabouts — one at the southbound off ramp intersection of Elmwood Street and West Main Street and a mini-roundabout at the northbound onramp intersection of Elm Street and Elm Court — resulted in noticeable improvements in traffic flow, particularly for southbound travelers exiting Route 146 onto West Main Street. 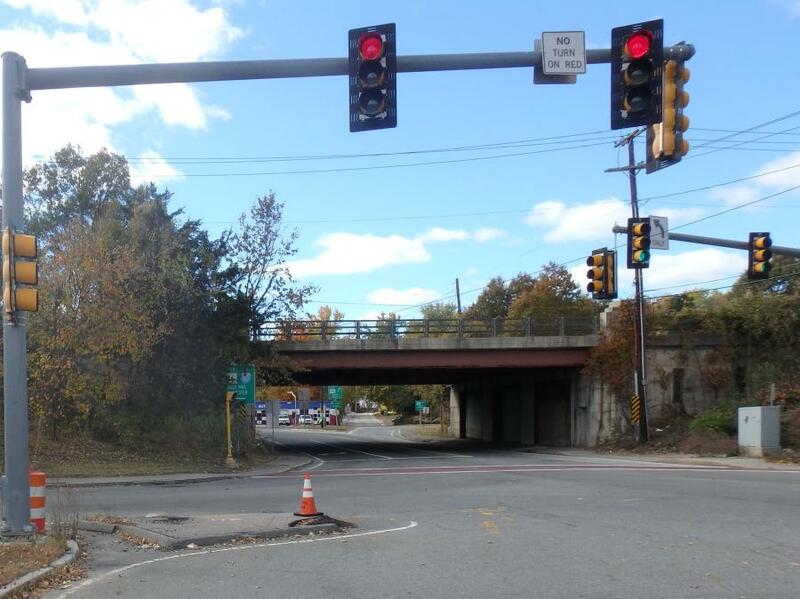 Prior to the installation of the roundabout, traffic would back up onto Route 146, “creating a very undesirable and unsafe condition,” according to Barry Lorion, acting District 3 Highway director. The reason for this unsafe condition was a result of the 1950s' interchange design that could no longer handle the increased volume of traffic traveling through the area. In 2011, MassDOT calculated the average volume of traffic on Route 146 at 45,500 vehicles, and 14,500 vehicles traveled along West Main Street and Elm Street. In the Route 146 Transportation Study, prepared by the Executive Office of Transportation and Office of Transportation Planning and published in December 2005, this intersection at Route 146's exit 8 was one of five identified as needing to be improved. When it came time to design the project, a new six-lane, single-span bridge was proposed since the current four-lane, three-span bridge lacked acceleration and de-acceleration lanes, essentially making it “functionally obsolete,” Lorion explained. To improve safety and traffic flow through the onramp and offramp intersections, roundabouts were identified as achieving the project goals, because “these modern roundabouts have more vehicle capacity than the previous intersections and also reduce crashes,” he said. With a bid amount of just over $20.4 million, the five-year construction contract was awarded to J.H. 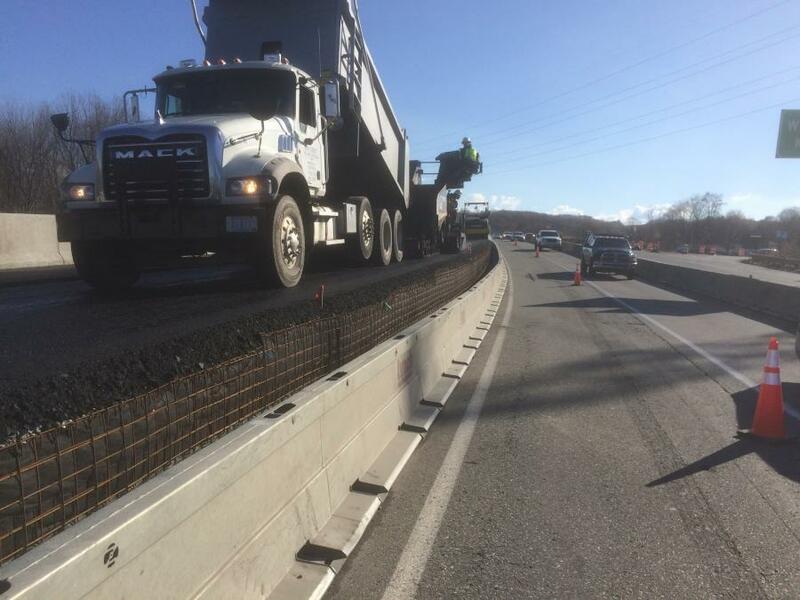 Lynch & Sons Inc., a firm that has worked on other MassDOT projects. After receiving notice to proceed on September 2015, crews started the first phase of the project, which was the utility relocation. “We took all the existing overhead utility lines and put them underground in order to construct the bridge,” Lorion said. A three-phase approach was taken to construct the new bridge. For the first phase, the northbound traffic shifted onto the southbound span so the northbound span could be demolished. When constructing the bridge, Lorion said that because the bridge profile was modified, the contractor had to install an earth support system. 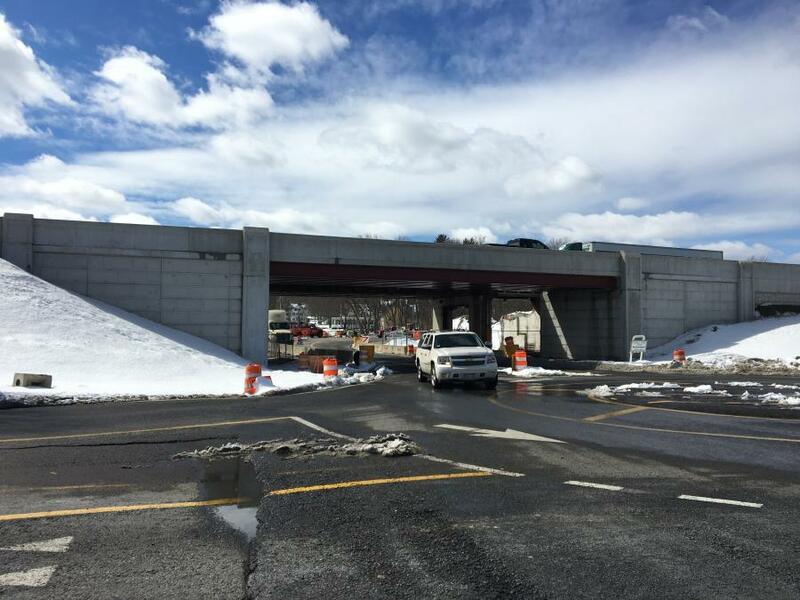 Construction of the two-lane northbound span, along with its exit and onramp, was completed at the end of 2017. Steve Shamoian, a resident engineer with MassDOT, said that they are now on phase 2 and the demolition of the southbound span was finished in February. 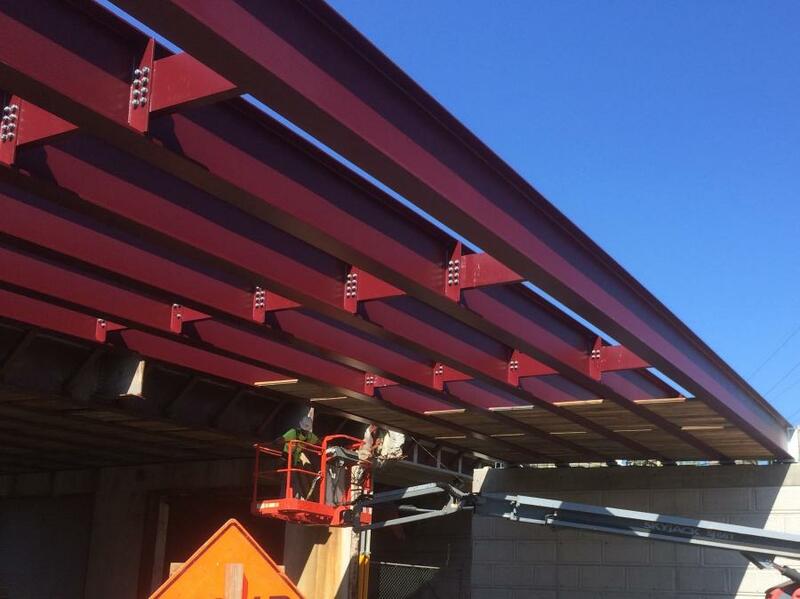 It's expected the construction of the southbound span and its exit and on-ramp will be completed at the end of 2018. Phase 3, which is expected to take all of 2019, will consist of constructing the median and subsequently configuring the roadway to include the new acceleration and deacceleration lanes. The final paving and lane marking will occur in spring 2020. To date 750 cu. yd. of concrete have been removed from the site, while 1,025 cu. yd. and 145,000 lbs. of rebar have been used to construct the new bridge. To maintain the four lanes of traffic at all times, the northbound lanes were shifted onto the median on the southbound side of the bridge, and the southbound lanes were shifted over into the breakdown lane. Although the majority of the work is being completed during the day, the on-ramps and off-ramps have been closed at night. 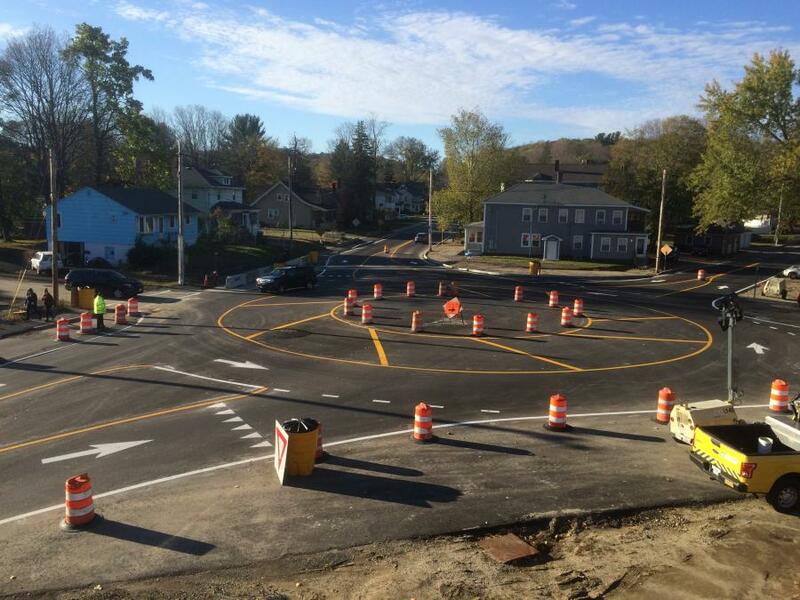 Also installed during the summer and fall of 2017 were the two roundabouts at the Route 146 southbound off-ramp at West Main Street and the intersection of Elm Street and Elm Court. “Even though the roundabouts are in a temporary configuration, we've seen an immediate improvement at both locations,” Shamoian said. The final curbing and sidewalks will be completed in fall 2019. In addition to improving traffic flow, the roundabout design also improves the access of pedestrian and bicyclist through the intersections. Lorion said that they are still on schedule for a spring 2020 completion date.